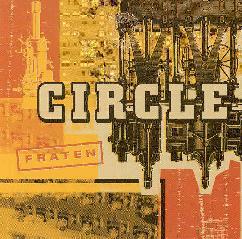 Circle is a six piece from Finland that plays a unique blend of space rock, psychedelia, and avant-garde progressive. The band consists of T. Elo on guitars and vocals, T. Harrivaara on bass and doublebass, J. Lehtisalo on guitars, keyboards, and vocals, T. Niemela on keyboards and stick, J. Peltomaki on drums, and V. Raitio on percussion. "Paneeli" is one of the more overtly spacerock tracks. Trippy, high pitched synths jam along with the music. One simple but disturbing melody line continues as some Gong-like chanting is introduced and the synths start to get a bit wilder and are drawn more into the foreground. This is one of my favorite tunes on the disc. "Hissi" features some tribal percussion at the forefront with moments of spacey guitar lines. The intensity builds very slowly as the guitars and keyboards start to add the trademark Circle repeating, but subtly changing melodies. This song reminded a lot of Holy River Family Band. Two of the more psychedelic tunes on Fraten are "Rengastus" and "Isaak". "Rengastus" is a heavy rockin' psych tune that is made unique by the Circle penchant for repetition and dissonance. Several layers of keys and synths are introduced and the keyboards duel with the guitar for an easy-paced intensity. "Isaak" features some freaky psych guitar and chanting vocals, and the pace picks up more than heard on other tunes on Fraten. The drums maintain a steady, danceable beat while the synths gurgle, the guitars solo, and some further Fred Frith sounding guitar work comes into play. It strikes me as being like an avant Ozric Tentacles. Very interesting. And "Katolla" is another trippy Gong-like tune that sounds like something off of "You". Two tunes that fall outside that space/psych framework but are worth mentioning are "Hiiret" and "Kentta". "Hiiret" is an even more Fred Frith sounding song that could have come straight off his "Gravity" or "Speechless" albums. "Kentta" sounds exactly like an old Univers Zero or Present song. Slow, brooding bass and drums create an extremely dark atmosphere as steadily pulsating synths provide an underlying texture. Though well done and an interesting contrast to the other tracks, Kentta would need some more development to justify its nine minute length. In summary, if you are set in your ways as to what spacerock is supposed to be about then Circle may not be for you. But if your horizons are wide and you're in the mood for something spaced out but different than Circle is worth checking out.